To help you find the information most important to YOU, we organized this information into a FAQ. Why should I convert my Jaguar to a Chevy driveline? Which Chevy engine should I use in my conversion? Which transmission is best for my conversion? How much will a used Chevy driveline cost me? Why buy a Johns Cars conversion kit instead of someone elses? What is INCLUDED in a Johns Cars conversion kit? Whats NOT INCLUDED in the regular kit? How much is a Johns Cars conversion kit? How do I order a JCI conversion kit and how soon will I receive it??? Reliability: The most important reason to put a Chevy V8 and transmission in your Jaguar  long life, and dependable, economical service. Plus you get the convenience of having a Chevy motor, transmission and accessories that everybody stocks and most anyone can fix  dont get stranded waiting for Jaguar parts (and a Jaguar specialist) in Smalltown USA. Affordability: The Chevrolet V8 is easy to install and maintain, meaning fewer problems (and expenses) now and in the future. When your GM water pump dies it costs $50.00 for a new one, not $230.00. And if you have the grueling commute every day, your conversion will pay itself with 15-18 mpg in the city and 19-22 mpg on the highway. Wrecker bills and car rentals will vanish instead of your day off. Driveability: Reliability and economy are the reasons why most people convert their Jaguars, but driveability is what they love the most. The V8 possesses more torque and power than the Jaguar 6 or 12 cylinder, giving you more GO off the line and more passing power on the highway . Also, the V8 driveline moves the center of gravity slightly rearward and lower, improving handling. All in all, the conversion will give you confidence and peace of mind. With a Chevrolet V8 in place, you "exorcize" the typical demons: overheating, crossmember fatigue, engine mount cracking, plus the electrical shortages from Lucas... the people who invented darkness! Unfortunately the lack of oil on your driveway will cause it to rust and the local dealer will probably refuse to service your hybrid kitty. That in itself isnt all bad as most dealerships generally only know about the last 2 or 3 years of Jaguars. After considering or trying every modern American V8 and 6-cylinder for the XJ series, I settled on the Chevrolet V8 with a GM trans and accessories. Why the Chevrolet and not Cadillac, Olds, Buick or Ford? Other engines fit in the space but all require compromises: motor mount fatigue problems, cobbled exhaust manifolds (restrict breathing), butchered oil pan (for clearance), etc. Plus the Chevrolet V8 and parts for it can be found the world over. I have V8 customers in Australia, Brazil, Germany, Guam, Japan, Korea, Philippines, Saudi Arabia, Sweden, and even the UK! Everyplace has a Chevy water pump. Block Stock small block motors provide considerable improvements over Jag power. Use a 305 (5.0) for fuel economy or a 350 (5.7) for more punch. Other V8 sizes, 327, 400 (small block) etc. are also suitable. I am definitely pro Hot Rod but I dont want you to get the idea that you need a high performance motor to motivate that Kitty (the OEM 6 and 12 are 4.2 and 5.3L respectively). Fuel Injection (FI): For years weve suggested carb motors to keep it simple, however, GM has the bugs worked out and we are ready when you are. Four OEM systems are available, throttle body injection (TBI) that uses a carb looking unit with two centrally located injectors, tuned port injection (TPI) with an injector at each port, the high revving LT-1, and the completely new Vortec V8 motor. All of these FI systems work great with a JCI Conversion Kit. LT-1 Notes: GM completely redesigned the small block with the LT-1. It is a very clean setup - not the 80's bag on snakes, plumbing and servicing nightmare. 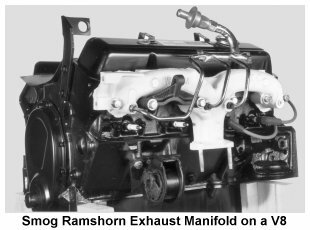 The LT-1 and 4300 derivative have the EGR plumbed externally into the rear of the intake because GM deleted the exhaust crossover passage in the heads. It is best to keep the EGR because it reduces spark knock, reduces emissions, and allows the computer to signal more ignition advance (better performance). I have a pair of exhaust manifolds with the required modifications, parts, and plumbing necessary to retain the EGR. AIR - air induction reaction - is also accommodated with these manifolds (a must in communities with emission controls requirements). AIR only functions the first minute or so of operation - it helps complete combustion and light off the catalytic converters sooner. The air pump on LT-1 is electric and is controlled by the ECM. Fuel Injection $$$: Add $100.00 to the JCI Kit Price when using a FI V8 motor for the many changes required for this V8 kit  cooling system, electrical, steering and A/C plumbing, etc. plus 8 more pages of instructions. This is not an ECM or fuel injection harness. Performance... The converted V8-Jaguar weighs 105 to 400 lbs. less than a Jaguar-Jaguar and has a more central and lower center of gravity. This diet enhances handling and corrects the common nose down attitude (due to front spring sag) without detracting from the ride quality for which Jaguar is renowned. Fuel consumption averages 15-18 city, and 20+ MPG on the road using stock V8 drivelines  fuel injection cars do a little better. In general, a stock small block V8 is considerably quicker than even the V12. Block If you are after a sleeper or a torquey tire smoker for the stoplight drags, our Chevy BIG Block 396-402-427 -454-502-??? conversion kit is the answer. The kit is 100% bolt-in, of course, absolutely no butchering, and like the small blocks, everything works. A V12 car is preferred for front suspension, exhaust, positraction (POWER-LOK) and rear axle ratios but refitting the proper pieces to a 6-cylinder car will achieve the desired results. The kit is not compatible with raised block or truck motors. A T400 automatic transmission is recommended and a passenger car oil pan is needed. High rise intake manifolds will not fit under stock XJS hood. Two barrel intake will not clear hood. The long (A6) air-conditioning compressor on the drivers side is required. A gear drive Super Starter is suggested  it affords a bit more header clearance and we have them in stock. Performance... Performance specs...QUICK! A big block Jag still weighs 100 lbs. less than a 12-cylinder car. Center of gravity is even lower than the Chevy small block. Pilots license required before taking off in your new toy and dont forget to up the limit on your gas card. No liability assumed for behavioral changes. Unless you need a super performer, I suggest the small block, even if you build a slightly non-stock or fuel injection version for more horsepower. Big blocks are nice, but they require more attention and the resale of your Jaguar will be limited to the performance oriented buyer. I strongly recommend you purchase a COMPLETE "pull-out" engine with transmission, fan, all accessories and brackets, trans oil cooler lines, air filter assembly (with a flat top), etc., as a package. Buying a piece at a time will drive you and the parts person nuts, not to mention the added time and money. Alternatively, consider also buying an older but complete Chevrolet car and rebuilding the motor, transmission, etc. Performance mods are easy to do at overhaul time. I suggest 1969-up long style water pump and brackets, internal regulator alternator and HEI distributor. The main point is to get the new driveline COMPLETE  even if you have to buy an entire car to do it! Emission equipment  not just for LA anymore. All the needed equipment  catalytic converter(s), air pump, preheated air cleaner assembly, PCV and EGR valves, heat riser or EFE, vapor canister, etc  will fit when using my V8 kit. Important: Check with your local authorities or inspection facilities to determine what is required for your conversion. Usually, the newest factor (engine or car) determines what year standards you will have to meet, but again, check with the local authorities. Sometimes they will insist on a FI V8 if your Jag had fuel injection, and others won't let you use a truck motor in a passenger car. If they waffle, have them put it in writing! California: Call 800-952-5210 for official literature. As we understand the laws, cars manufactured in 1973 or earlier are exempt from emissions (a 30 year rolling exemption law begins 2004 ). All newer V8 Fuel Injection conversions must have a VSS and an ALDL port for the smog test. Note: If you're installing a V8 into a Jaguar with an electric speedo, you will need JCI's VSS Buffer. (BONUS: it eliminates the flaky Lucas speedo transducer). JCI Headers are not CARB approved  you must use GM exhaust. NOTE: If you are not ready for a full conversion, I offer Quarterbreed  a GM transmission behind a Jaguar 6-cylinder or V12 engine... and when youre ready for the V8, send in your leftover Quarterbreed parts and Ill credit part of them towards the V8 conversion. T400 for super duty applications. 2.88 Jags: If your V8 comes with a T700, but your Jaguar has the high ratio rear end, go ahead and use it... don't spend your time and money exchanging it for the T350. T350 The T350 was introduced in the mid 60s and underwent the same woes as the early T700. No amount of testing will replace what the public can do  the 5 million miles of XJ40 testing didnt uncover the surprises found in the real world. The T350 trans is ideal for the horsepower/weight combination of the XJ Series with a Chevrolet V8 and 2.88 rear axle. T400 The time honored T400 is not required unless you have a big block, hot rod small block or plan on towing a trailer. Installing a T400 with the V8 does not make anything easier/harder/handier. The Jaguar version of the T400 will not bolt to any GM engine. V12/T400 Note: If you have a V12 with the Jaguar T400, we have developed an adapter plate and associated hardware so you can reuse the Jaguar T400 behind the Chevy V8. This is called the J400 upgrade and is $250.00. You will also need to purchase a torque converter and starter seperately. 4L60E The T700 transmission is GMs automatic overdrive unit introduced in 1982. Although skepticism was high, I installed a T700 in the first Series 3 car I converted that same year. After 90,000 miles in three years I was convinced enough to endorse it and in 1992 it was still going strong with 135,000 miles. Why am I pro 700? The 30% overdrive reduces cruising RPM and thus wear and tear on the engine/accessories. All T700's have torque-convertor lockup and it must be hooked up to prevent damage to the transmission. If you are using a T700/4L60 with any GM Fuel Injection V8 (TBI, TPI, LT-1, or Vortec), the computer should be able to control the torque-converter lockup on the transmission. Also, Electronic Carburetted Quadrajets with Electronic Spark Control (ESC) will operate a T700 lockup. The 4L60E is the electronic version of the T700 and requires a FI computer to operate at all. A VSS is required for the the FI computer to operate properly, and you will need a JCI VSS Buffer Box to provide the proper signals to Jaguars with electronic speedometers. If you are using a T700/4L60 with a regular carburettor or aftermarket system with no provision for T700 lockup, modifications ARE necessary as the T700 was designed to function with GMs engine management system. Johns Cars has developed Electrolock, a lockup kit for the T700 transmission optimized for our V8 installations without the complicated computers. The kit with JCI instructions is $85.00 (this is not included in the T700 upgrade). Operation of the T700 without modification will definitely shorten trans life. Buy a COMPLETE "pull out" engine with transmission and all accessories as a package  buy the entire car if you have too! This is especially important on Fuel Injections motors  youll need the ECM, harness, relays, fan(s), etc. Use a carburetted motor for the simplest installation and maintenance. Use a small block engine  big blocks are nice, but they require more attention and the resale of your Jaguar will be limited to the performance oriented buyer. Truck TBI motor accessories will not clear an XJS hood, use passenger car setups instead. Here are some estimates for a used Chevy engine and transmission assembly and other items not included. Ready to install radiators, fan shrouds, and driveshafts are available in the ONE STOP SHOPPING DEAL below! Conversions are NOT all created equal  not only aesthetically but more importantly, the feel (ride, drive and sound) and safety. Completeness: With well over 4000 XJ conversions behind me, we know what the problems and pitfalls are and my kit helps you avoid them. We continue to refine the kit to keep it the best solution for you. If you are happy with your conversion, you become the best advertisement available. Our kits include over 100 pieces, require absolutely no mods to the exterior or interior of car and the instrumentation functions as original. No cutting, fabrication or welding required. This conversion is 100% bolt-in... meaning it is done without special tools or training. See What You Really Want to Know! on page 8 for more technical information on our kits. References: John's Cars can provide references regarding Quality, Experience, Service, Performance, Availability, and Resale value unmatched by anyone  check us out! If you request, I'll direct you to others who have been down the long hard road without the JCI Kit. Help! Technical help is part of the deal! Our parts people have done conversions  should you have a question concerning the V8 installation, we're here Monday to Friday, 8am to 6pm CST for technical questions (not four hours here or there). However, we can't help with Joe Stroke's 39.95 "HOW TO DO IT" (not) manual nor ABC's nitrous or fuel injection setup  call the mouse you bought it from. COME ON! When you buy your JCI kit, we credit the $20.00 towards your kit purchase plus youll get your tachometer calibrated for free (when you buy the regular kit) or a free set of my trick polyurethane bushings (when you buy the One Stop Shopping Deal). Just Do It: Buy my kit, start it, finish it, and drive it down the road. Lots of people could make one run, but after how many months and what is the resale value of a Heinz 57? It takes longer to repair that junkyard creation than to start from scratch with the complete kit. Converting your XJ with a carbureted V8 takes 16-24 hours exclusive of detailing. Detailing is the effort that shines, from repainting the engine compartment, the brake booster and heat shields to a fresh coat of paint on the V8 and installation of the chrome dress-ups desired. A full weeks' worth of attention is necessary for a first class conversion  it will "SHOW and GO". SHOPS: My kits fit and work. The average hours billed out to a customer often being only 50% of the man-hours worked due to circumstances beyond your control, parts delayed, boxed wrong, shuffling jobs, etc. etc., it is reasonable to have a job that delivers without those comebacks that eat your lunch (and reputation) quicker than _____. ! The Original: Imitation is the sincerest form of flattery, but I have yet to see another conversion kit that flatters me. Everyone selling kits or plans has had one of my kits, yet their product and workmanship do not come close to the JCI standard. How good are my kits  when you look closely, you'll find pictures of my conversions, kit parts and instructions in "their" literature. Almost daily someone new is trying to cash in with a $100, $200 or $300 mounting kit. Service after the sale  ha  they already got your $$$$. Maybe I'm a bit wordy... I think you would rather know some of the pitfalls now than find out later. If you are saddled with one of these bailing wire catastrophes, I'll give you $100 credit on a kit purchase when you trade in the MONGREL parts. "Do it yourself" plans also eligible for credit. Please call for details. Resale: Finally, a John's Cars V8 Jaguar is worth more than a standard Jaguar-Jaguar! The V8 conversion alone does not do it; it has to be a proper job with a secure track record. A non-JCI conversion sells for 50%-70% below the value of an equivalent John's Cars XJ-V8 Jaguar. Still not a believer? Read our Customer Testimonials to hear what our customers think about us and our products. Miscellaneous hoses, clamps, adapters, spacers, hardware, etc.... EVERYTHING! I also electroplate (black) most parts so you wont spray paint your fingers. My kit parts are not sold separately to prevent outlaws from misrepresenting cars as having Johns Cars Conversion. Small Block kits are also available for right hand drive cars. a fusible link protecting the wiring in case of an electrical malfunction as many of the circuits in your sedan are not fuse protected and stay "hot" even when you are away from the car.  These items are included in the One Stop Shopping Deal (OSD) conversion kit. A replacement radiator and Sedan fan shroud are dealer parts. Many installations can use stock length GM driveshafts (specs are supplied with the kit). Our engine function wiring harness connects the V8 accessories to the Jaguar gauges and controls (ignition, A/C). 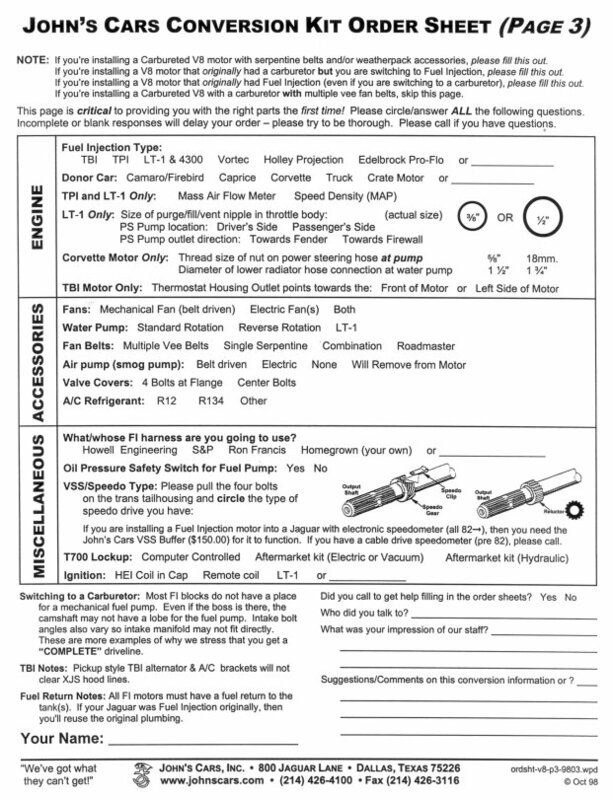 It is NOT a fuel injection or engine control harness  if you are using a fuel injection V8, carburetors with wired sensors and/or computers, distributors with spark control, or transmissions with electronic controls, you will need reuse the original GM system or find an aftermarket solution (like the two companies mentioned above). I recommend the One Stop Shopping Deal (OSD) regardless of your profession. Having it all there goes a long way when youre burning the midnight oil  the time lost chasing/making one meager part is often more time than it takes to finish with my kit. Cost out the parts: radiator, driveshaft, tach calibration, freight, etc. youll find the OSD a real deal. Please call for pricing on air freight service, or service to Alaska, Hawaii, Puerto Rico or outside the USA. READ all the notes as they will save us both time, money and headaches!!! More Questions? We are open Monday to Friday, 8am  6pm CST. A. If youre using a Carburetted V8 with a Serpentine Belt and/or Accessories with Weatherpack-type plugs, please add $50.00 to your kit. B. If you are using a Fuel Injection Chevy Small Block of any type (TBI, TPI, LT-1, Vortec), add $100.00 to the price of your kit. Small Block OSD kits for TPI or LT-1 motors do not require fan shroud. C. Small Block kits do not include exhaust. I offer both Ramshorn manifolds or Tri-Y headers for use with your conversion. I actually prefer stock cast iron manifolds as they are less trouble in the short and long run. The headers are a Tri-Y style of my design with 1.5 inch primary tubes (no commercial headers will fit a V8 Jag). D. Small Block kits are available for right hand drive cars  add $50.00. 2 Super duty radiator is suggested for 400+ CID or hot rod motors. Add $50.00 to Small Block OSD. The super duty is standard with BIG Block OSD. 3 A replacement radiator is a must for all fuel injection 6-cylinder cars. Included with either OSD or available separately (see the next page for pricing). 4 XJS Notes: Springs are necessary when you convert your XJS to a Chevy Small Block due to the weight loss. I have developed springs specifically for the XJS-V8 Small Block conversion (individually priced on the next page). Cutting a coil, heating the spring, XJ6 springs and spacers are all compromises used by the other guys that RUIN the ride! BIG Blocks do not require V8 springs. XJS shroud is available with kit purchase only. 5 BIG BLOCK NOTES: Custom-made four tube headers are included with the kit as stock GM manifolds will not work. Headers mate directly to the V12 exhaust (pre H.E.). 6-cylinder and HE cars require a trip to the muffler shop to dual out the system. Headers with AIR (Air Induction Reaction) fittings are available on special order only  add $100.00 to your kit. BIG Block kits are not available for right hand drive cars. J400 If you have a Jaguar V12 with a GM T400, we have developed an add-on kit to let you reuse your transmission. We call it the J400. Just order your kit like you were going to use a regular GM transmission, then check the J400 Transmission Option (available with OSD only). You'll also need to get a torque converter and starter seperately (part numbers supplied with kit). J400 Option - Reuse your Jaguar T400 (V12 only) behind your V8. Note: These "upgrades" supply you with the different kit parts you need specific to your motor and trans. XJ V8 Conversion Kit Goodies BONUS! 6 BONUS! You get a better price on most kit goodies when you are a Johns Cars XJ-V8 kit customer. I sell a few goodies separate from the kit to help out the guys doing it in their backyard. 7 Tachometer Calibration: for the tachometer to report correctly, it must be calibrated or it will operate with a discrepancy of 25% or 33%! Each unit is bench tested to verify accuracy. In-house time is usually 5-7 days. I can repair most units for a nominal charge when required. Exchange units are not available  I need your core. Call for Hawaii or air freight. 8 We grind the Ramshorn manifolds to provide required additional clearance for the center bolt valve covers. All 1987-on V8's have center bolt valve covers. Add $25.00 if you have center bolt valve covers. 9 Do you have a need for speed? Your GM Fuel Injection motor definitely does. Accurate feedback helps maximize fuel economy and decrease emissions. I strongly recommend you integrate these functions with your FI-V8 conversion. The JCI GM-JAG BUFFER box is a signal conditioner that takes the GM signal and multiplies it for the Jag speedo, cruise, and trip computer  plus youll eliminate the flaky Lucas transducer. Must have for California emissions. To order a JCI conversion kit, complete the three CONVERSION ORDER SHEETS and send them in with certified funds or money order. No COD, credit cards, or personal/company checks. No exceptions! KITS are in STOCK and shipped upon receipt of funds. Fill in as much information on the order sheet as possible as there are over 6000 variations. Especially important are the year, model, and the Vehicle Identification Number (VIN) of your car, the engine and transmission you plan to use, the tire size and the last 3 or 4 numbers (940, 1000, 1020, etc.) from your speedometer. Also, specify long or short compressor on the driver or passenger side of the motor, the type of radiator to be used (Jaguar or GM), and any other variations (European?) when ordering. The order sheets are JPEG images (about 185K each) so it will take a minute or so to load. Print it out from a Laser, LED or ink-jet printer only  dot matrix printer will be useless. Make sure your print margins are set to .50 inches or it may not fit on a page. Please call if youd like help filling out your order sheets. Please call  remember my fondness for phone tag plus I may not be able to get it in UPS the same day if your order is not complete. If you have any questions about our conversion kit, please call or email them to xjv8@johnscars.com. Prices subject to change without notice. Note: Given the proprietary nature of my conversion kits, I do not allow the return of a conversion kit for any reason.